Florals are a classic motif in embroidery, but they're also a bit of a trend. Whether you want to stitch some flowers because they are popular now or because you've always loved them, today you can learn how to make them really, really tiny. These flowers are seriously minuscule, which makes them so very sweet. The entire cluster above is less than 1 inch at its widest point! You might be thinking, why would you want to embroider such tiny flowers? Well, they make a good addition to other florals, but they're also good for making covered buttons and lots of tiny-hooped jewelry projects. You could even add some flora to shirt cuffs or collars. You'll learn how to form three types of flowers: roses, daffodils, and pansies (which can also be made into irises). After you learn how to make a few flowers, experiment with making other varieties and arranging them into your own miniature stitched garden! Call this a rose, a marigold, or any other full blossom. When you embroider your own flowers, you get to decide what you made! To make a tiny rose, start with two tiny parallel straight stitches. This will be the filled center. Begin working your way around the center with stem stitch. Take tiny stitches, forming a circle. Continue working around the circle until it reaches the size you want. Finish with a stitch that goes down and overlaps on the inside of a previous stitch. Try mixing this up with a contrasting color for the center. Daffodils have a very dimensional quality, and while this embroidered version is fairly flat, it still conveys the look of the "cup" in the center. You can work this in one or two colors. To make a tiny daffodil, start with a loose french knot for the center. To achieve this, don't hold the working thread too tight around the needle by pulling it through. You want to create the slightly sloppy knot that you normally would try to avoid. Form each petal with three straight stitches. The first should be the longest and will be the middle of the petal. Add two more stitches to make a filled triangle shape. Give your daffodil five or six petals. This style flower can be adapted to be either a pansy or an iris, depending on how full you make each section. Try working in one or two colors. To make a tiny pansy/iris, start with two or three detached chain stitches, as though you are making part of a lazy daisy. This forms the lower petals. Come up from the center and make a single detached chain, but instead of tacking down the stitch, you will now jump over to work blanket stitch. Go down through the flower center and back up at the top of the upper petal section, keeping the working thread under the needle. Form a fan of blanket stitch, working from the center of the flower. Making a wider fan of both upper and lower stitches will result in a pansy, while narrowing the fans looks more like an iris. You can also add tiny, contrasting straight stitches for details that radiate from the center. 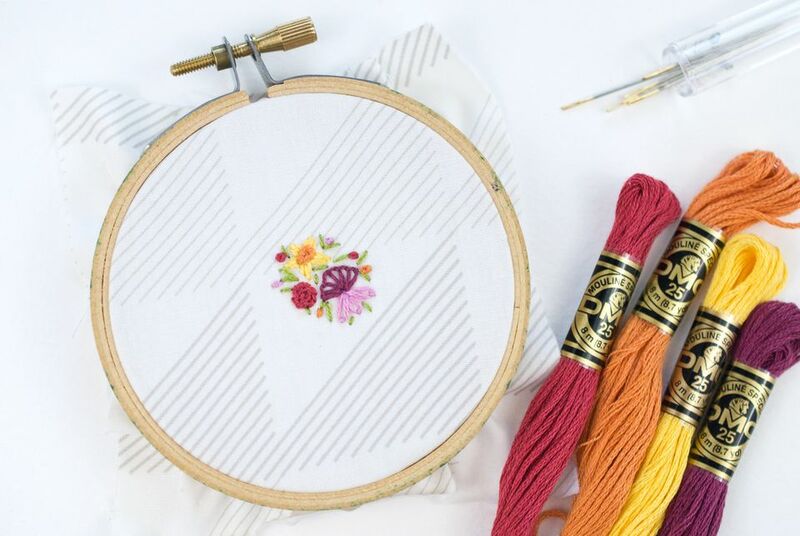 Use straight stitches to add some simple stems and leaves and a few french knots for extra tiny flower buds, and you've just created your own embroidered garden!